You want to be very significant in the eyes of other people. In the truest sense of the word you want to be recognized. You want to be heard. You want to stand out. You want to be known. In particular, you want to be known and appreciated for the unique strengths you bring. You feel a need to be admired as credible, professional, and successful. Likewise, you want to associate with others who are credible, professional, and successful. And if they aren't, you will push them to achieve until they are. Or you will move on. An independent spirit, you want your work to be a way of life rather than a job, and in that work you want to be given free rein, the leeway to do things your way. Your yearnings feel intense to you, and you honor those yearnings. And so your life is filled with goals, achievements, or qualifications that you crave. Whatever your focus -- and each person is distinct -- your Significance theme will keep pulling you upward, away from the mediocre toward the exceptional. It is the theme that keeps you reaching. Choose jobs or positions in which you can determine your own tasks and actions. You will enjoy the exposure that comes with independence. Your reputation is important to you, so decide what it should be and tend to it in the smallest detail. For example, identify and earn a designation that will add to your credibility, write an article that will give you visibility, or volunteer to speak in front of a group who will admire your achievements. Make a list of the goals, achievements, and qualifications you crave and post them where you will see them every day. Use this list to inspire yourself. Identify your best moment of recognition or praise. What was it for? Who gave it to you? Who was the audience? What do you have to do to recreate that moment? Share your dreams and goals with your family or closest colleagues. Their expectations will keep you reaching. Stay focused on performance. Your strong Significance theme will drive you to claim outstanding goals. Your performance had better match these goals, or others might come to label you as only a big talker. Write down your strengths and refer to them frequently. Heightened awareness of your strengths will give you the confidence you need to rebound, when, for whatever reason, your "audiences" are not giving you the feedback you need. Accept that, unless you possess a strong Self-Assurance theme, you might fear failure. Don't let this fear prevent you from staking claims to excellence. Instead, use it to focus on ensuring that your performance matches your claims. 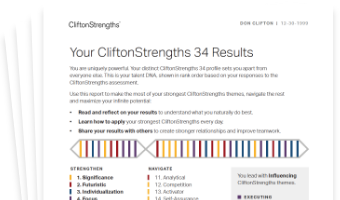 See how Significance shows in your CliftonStrengths results -- discover All 34 CliftonStrengths Themes today!